My Very Positive Experience While Obtaining Substantial and Excellent Dental Work Performed By Dr. Mario in Escazu, Costa Rica. These are my experiences while obtaining substantial and excellent dental work performed by Dr. Mario in Escazu, Costa Rica, where dental tourism is almost as commonplace as amusement park tourism in Orlando. Mario Garita Carrillo was born to be a dentist. He just didn’t know it. He came from a family that had already played a integral role in the history of Costa Rica. His great-great-grandmother had immigrated from Czechoslovakia and married a Costa Rica national. I have great news for you if you need a dental implant. I have been comparing prices for dental implants for some years now. In the US the average price runs about $1700. In Canada, twice that price, almost US$4000. From Disaster to Delight – Our dental vacation in Costa Rica! It has been said that FEAR is False Evidence Appearing Real. There are many kinds of fear, like fear of the unknown or fear of what you think you know. The word dentist brings the second type of fear and going to another country to see that dentist brings the first fear. Well now, that sounds like quite a combination. In fact its an unbeatable combination. Are You Curious About Getting Your Teeth Fixed in Costa Rica? My A+ Experience with a Blue Cross Preferred Costa Rica Dentist and My “Guardian Angel” Charlie Dennard. Then fate got involved… A few days later, I received a call from a guy named Charlie Dennard. That single phone call changed my life dramatically. Ask Your Favourite Costa Rica Dentist Dr. Mario! Get your free dental consultation with Dr. Mario in Person or by telephone. So, you moan to yourself again as you remember that you have to get to the dentist to have that long overdo check-up. But then you remember why you have put it off for the last several years. Was It Your Dentist Who Killed A Lion Recently? Come to Costa Rica where hunting is illegal and the dentists are affordable! The American Dental Association reports that the average gross business for owner dentists in 2013 was $646,440 for a general practitioner and $857,110 for a dentist who specializes. How A Special Dentist in Costa Rica Saved My Mouth and My Sanity! About four years ago, my dentist here in the USA broke the bad news. “Your mouth is in terrible shape,” he said. I had a fifteen year old bridge spanning seven front upper teeth. The problem was, three of the teeth were missing underneath due to sports injuries and the other four gave me such pain, half my face was intermittently numb. Facing A Dental Disaster? Dr. Mario to the rescue! Once your teeth have reached a certain point of decay there is a point of no return. You cannot necessarily see or feel that tipping point but there is one. It is remarkable how we can live with teeth that are not only unattractive but downright embarrassing. Your Dental Coordinator Charlie Dennard: Your companion, counselor and guide. My name is Charlie Dennard and I am the patient consultant for Dr. Mario in San Jose, Costa Rica. I live in San Jose and I have been working in the field of dental tourism with Dr. Mario and his staff for the last 5 years. Shopping For A Dentist in Costa Rica. Beware the bait and switch! 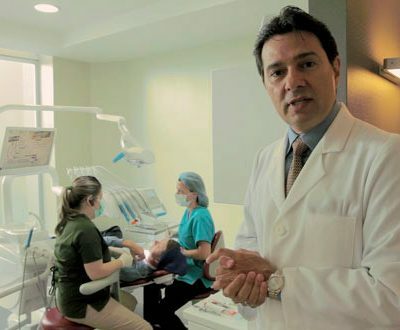 The cost of dentistry in the US has motivated individuals, some whom have never left the state where they were born, to hop on a plane and fly to Costa Rica to receive state-of-the-art dental care with a 40% saving over their US dentist. There are not many times that you will have this ‘perfect storm’ of lower oil prices, off season rates for hotel, rental car and airfares.